Waiting in the Colintraive fog for ferry services to resume on Thursday, October 1. 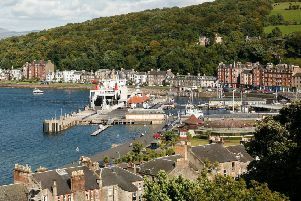 The temporary Rothesay-Gourock ferry service got off to a less-than-auspicious start on Thursday as the ‘disruption’ timetable was itself badly affected by a second day of thick fog on the Firth of Clyde. The new timetable, which is due to last for the next 24 weeks while Wemyss Bay pier is closed for major repairs, was meant to kick in with the 5.50am departure from Rothesay - but the severely limited visibility meant the first sailing of the day didn’t leave Rothesay until 1.25pm, with the first Gourock departure not until 2.55pm. The Rhubodach-Colintraive service was also suspended from the start of service on Thursday, for the same reason: by the time MV Loch Dunvegan undertook her first sailing of the day, at 11.30am, a queue of almost 80 vehicles had built up on the road into Colintraive, though a shuttle service soon cleared the backlog. Western Ferries, however, continued sailing normally between Hunter’s Quay and McInroy’s Point, with at least one Bute driver opting to make use of the new joint ticketing arrangement between the company and CalMac to reduce their journey time, rather than waiting for a sailing to or from Gourock or driving via Arrochar and Strachur. CalMac’s Firth of Clyde services were badly affected by the fog on both Wednesday and Thursday, with the two Arran routes, the Largs-Cumbrae service and the Tarbert-Portavadie crossing all disrupted or suspended at various times in addition to the problems on the two lifeline links to Bute.